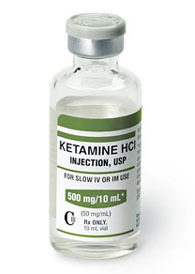 Ketamine is a drug that can be found in both human and veterinary medicine practices. It is a dissociative anesthetic that was developed in the year 1963 in order to replace PCP in the medical field. It can also be found on the streets illegally as a recreational drug, as the mechanism and chemical structure of ketamine are similar to those of PCP. Although it is helpful in reducing the discomforts of surgery and injury, ketamine has been sold as an intoxicant since the 1980s under the street names Vitamin K or Special K.
Ketamine has a variety of uses in humans. It is typically used as an anesthetic before surgeries or other producers that do not require the realization of muscles. It works by selectively interrupting pathways of the brain in order to relieve painful sensations. Ketamine can also be used as a liquid, gel, or cream a topical application for nerve pain. It may be used in emergency situations if a patient is suffering from severe trauma, and it can also be used to supplement epidural anesthesia in low doses. Ketamine is most commonly administered by a doctor in an injection form. It works the best if it is taken on an empty stomach. All property, including needles or syringes, should be properly disposed of and kept out of reach of children. A doctor or pharmacist will be able to explain state or local regulations for the proper disposal of this property. Another use is for the treatment of depression. Physicians are finding this newer form of Ketamine to be extremely effective in treating depression almost instantly, rather than the usual 4 to 6 weeks that traditional depression medications require for benefits to be seen. How is Ketamine used as a Treatment for Depression? Ketamine is given as a quick fix for severe cases of depression, often where there is a fear of suicide or where immediate intervention is required. It is believed that a dose of Ketamine, injected by a doctor to the bloodstream, can relieve suicidal thoughts within hours, and have lasting effects over many weeks. The majority of people who have received Ketamine as an antidepressant medication have done so in clinical studies, mostly because the drug has some disturbing side-effects, like hallucinations. Doctors have found, however, that not only does Ketamine work almost instantly; it is also very effective in patients who have failed to respond to traditional antidepressant treatment. Ketamine is classified as an NMDA receptor antagonist. Having hallucinogenic or euphoric properties, Ketamine is very different from a normal antidepressant medication. While most antidepressants work on the neurotransmitters serotonin or norepinephrine, Ketamine focuses on a different neurotransmitter called glutamate. Ketamine blocks the receptors critical for receiving glutamate’s signals, which improves the brain’s electrical flow, resulting in reduced depression. Ketamine can also result in a state of dissociative anesthesia, making one feel a generalized sense of well being. This anesthetic effect is why the drug is used for surgeries and, unfortunately, why it has an illegal street use. Part of what makes Ketamine effective for pain relief and immediate antidepressant benefits, is also what makes it desirable for illicit street use. The euphoric feelings or hallucinations allow patients, and those abusing the drug, to feel a removal of pain, and a general sense of well being that is close to approaching happiness. Falling in the same category as other opiates, Ketamine has addictive properties that require strict control, so it has not been legally put into a form where patients can administer it to themselves. Those who use this drug for recreational purposes may find it in powder or liquid forms that are not FDA approved and are illegal for purchase and use.